Your voice can make a powerful difference in a child's future! Our volunteers speak for abused children so they can find safe, loving homes. All you need is a passion for children and a few hours a month to spend with children who need a caring adult in their lives. Sign up today for our free training classes. It's flexible! 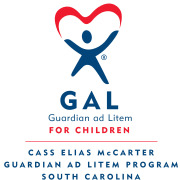 Call (864) 223-4681; or visit www.scgal.org.